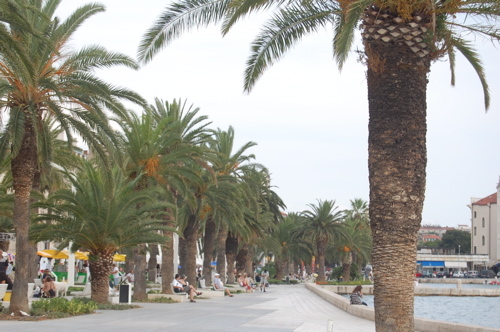 From the outset, my hope for Split was that it would be a Croatian home away from home. Home, that is, in the sense that recalls a place of comfort and refuge—and I certainly got my wish. But I know too well that home is a shade of gray, a place that’s wearing new clothes every time you leave or come back to it. 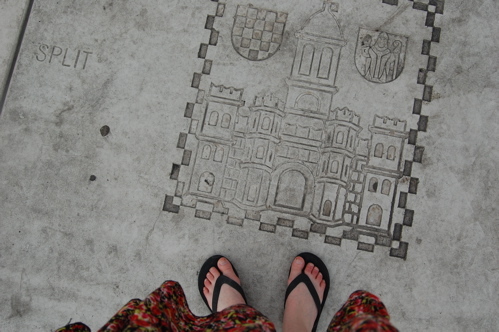 So it was with Split, a charming, magical little city that comforted and surprised me over the seven days I lived there. On our bus ride from the airport into town, I gazed out the window with bleary eyes, predisposed to feel who-knows-what about the place. The trans-Atlantic flight had been like commuting via day spa: red-lipsticked flight attendants providing hot towels and hot meals with a smile, and refilling our water and wine glasses before we’d even reached the bottom. Yes, I was starting to feel optimistic about Europe. 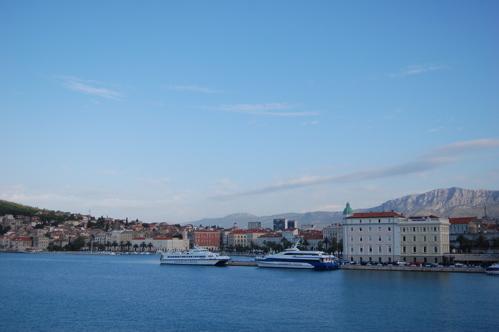 But I hadn’t seen more than blurry Wikipedia pictures of Split itself—chosen more for geographic convenience within the country than for anything else—and after so much traveling, I was verging on cranky. At first glance, our chosen destination seemed to offer a heavy dose of Eastern Europe: imposing Soviet-style high-rises dotted the outskirts of town (which Ted brightly deemed “less depressing” than their Russian cousins). But breaking through a cluster of cinder-block apartments, the Adriatic suddenly appeared like an oasis, shimmering azure below a coastline backed by craggy mountains. There was Italy, too, in these streets—lots to be had, I’d soon find, in the Roman architecture of Split’s old town, on the hairline curves of the coastal roads, and every night on my dinner plate. 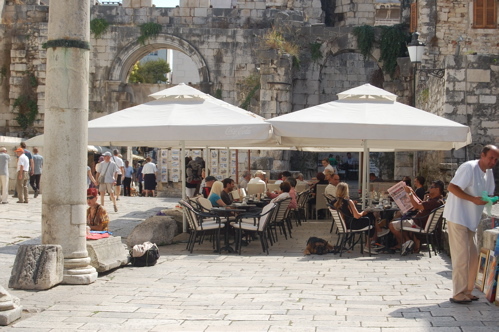 Diocletian’s Palace is the heart of Split, its old town and its soul, a place where street names matter little and aimless wandering matters much. 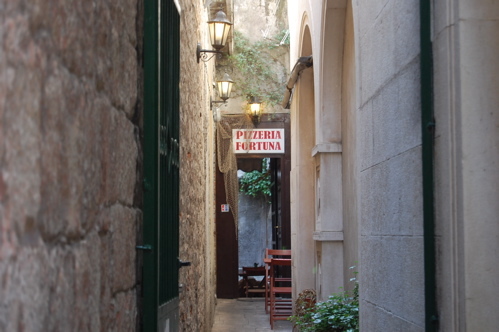 If I hadn’t put away my guidebook before setting out for our first dinner, I may not have let myself be pulled in so easily by the magnetic field surrounding Pizzeria Fortuna (unlisted in Lonely Planet’s book, though for what reason I have no idea). You know how you can tell the measure of a restaurant by the bread it serves? Well—yeah. It’s so true. One night, arriving late and hungry to dinner, we ordered some to quiet our growling stomachs. It arrived straight from the wood-burning oven, charred in places on the outside, dotted with fresh parsley and looking like a wonderfully puffed pita. We had to cut it into slices with a knife, though, because the inside was more than just hot air: it was soft and a tiny bit spongy, like a little loaf made out of pizza dough. We didn’t order that bread every night, but it was the embodiment of the reason we ended up at Pizzeria Fortuna for almost every one of our dinners in Split. The simplest things were done with so much care and attention: the arrangement of the hot peppers and thickly-sliced salami on the pizza pikante, the blistered, cheesy crust on the tiny casserole dish of pillowy gnocchi, and the way the Swiss chard was folded into the enormous soparnik, a sort of Dalmatian calzone. And yet it was hard to find a bad meal anywhere, whether that meant thin, floppy New York-style slices at Pizza Cut, or the meat-and-cheese filled burek pastry cut into pie-shaped wedges (unlike the tube-like, rolled börek I’d seen in Turkey). Gelato stands were a dime a dozen, but each had at least one novel flavor that practically jumped out from its frozen metal tub, begging for a taste-test. Unsurprisingly, I got roped into having at least two cones a day. Those flavors weren’t going to try themselves, people. After dinner was when the walking began, because the days had just been so full of sitting under café umbrellas and having cappuccinos and Croatian beer and looking out at the harbor, watching gigantic Jadrolinija ferries gliding to and from the coastal islands. I wasn’t so interested in the nightclubs that kept the palace walls thumping with house music until the wee hours, so instead we’d walk through the twisting alleyways where laundry hung drying overhead. We were looking, digesting. And, inevitably, we’d find something. One night, an accidental turn brought us into the square where the bell tower and cathedral were planted. On the steps framing those holy places, dozens of young and old people were planted too, with waiters milling around and serving drinks in a free-form kind of bar. Lanterns lit the place with a soft glow, and at the entrance to the bell tower, a middle-aged Croatian man sat with his amplified acoustic guitar, doing a spot-on cover of Eric Clapton’s “Layla” (the gorgeous version from his Unplugged sessions). Another night, on the Riva—the waterfront promenade backed by palm trees—a stage had been set up and used as a platform for a Deep Purple cover band. 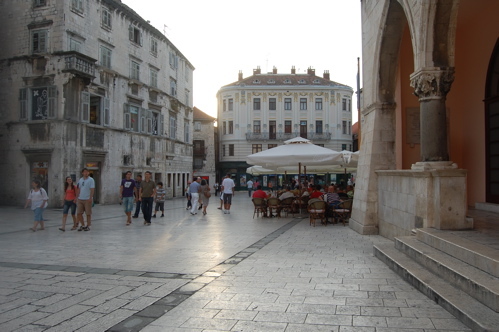 That stage later hosted teenagers in traditional frocks, the girls wearing long, neat plaits in their hair, and they all danced in a bouncily-choreographed display of Croatian folk culture. The palace walls are made of limestone and marble mined from a nearby island (the same place that gave the White House its construction materials). 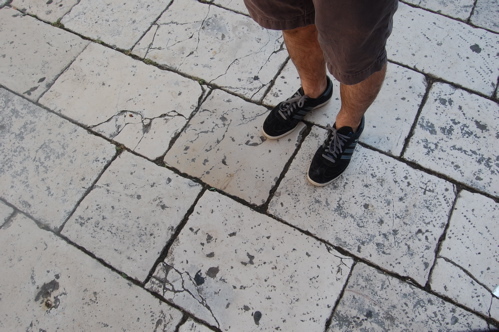 The ground, too, is a checkerboard of flat, worn slabs of stone. Every other day, I’d wake up to rain pattering outside the bedroom window, and I knew that when I ventured outside—hunched under an umbrella—that my tractionless ballet flats would slip and slide lamely as I walked in search of a morning pastry. I grew fond of the chocolate-filled croissant, the kroasan cokolada, from one particular bakery at the outskirts of the palace. Each time we stepped in the door, the two women behind the counter beamed. Although my boyfriend isn’t Croatian, he picked up the language like a natural, and the purveyors were charmed by his earnest banter. “It’s getting nicer and nicer to see you every day!” they greeted him in Croatian one morning. The trip wasn’t, as you can probably tell, difficult. There was a lot of taking-it-all-in, and a lot of make-more-room-in-your-stomach-for-gelato, and a few adventures to embark on (I’ll be telling you about them soon). But there was one night that came really darn close to difficult. We stumbled back into Split at 4 a.m. from Bosnia, which is a fascinating country that doesn’t seem too preoccupied about honoring its printed bus schedules. Ahem. But walking up the Riva, back to the tiny apartment in pre-dawn quiet, I felt a newfound appreciation for Split in the gently-lapping water that provided a soundtrack to the walk, and in the safe, warm arms of Split that welcomed me back into its embrace.